Our knowledgeable customer service representatives are ready to help! We take every precaution to ensure you are comfortable and your valuables are safe and secure. True month value at all Self Stor locations. We only have 12 Calendar billing cycles. Our Freight Acceptance Services can alleviate and reduce those anxious moments when it's time to move & store. We have all the required supplies under one roof! 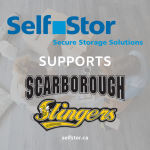 Since 1996, Self Stor has provided its customers with secure self storage solutions at locations in North York, Guelph, Richmond Hill and most recently in Etobicoke. We are members of the Self Storage Association, the international organization responsible for enhancing self storage business practices and promoting effective public policy related to the self storage industry. We pride ourselves on our ability to provide the utmost in service, security and professionalism in all interactions with our customers. We encourage you to tour one of our sites or contact us to reserve your self storage space now. Golf Cancer Classic The funds raised at the 2017 Women’s Health Golf Classic will enable the Interventional Pulmonology Program (IPP) to buy high-tech equipment that will allow Sunnybrook to introduce new, minimally invasive treatments and diagnostic procedures to patients whose cancer has spread to the chest. In addition, your support will cover a year of operational expenses related to supplies and personnel. Fight To End Cancer Founded in 2011, the Fight To End Cancer has raised over $500,000.00, in support of cancer research, with proceeds going directly to the Princess Margaret Urgent Cancer Priorities Fund at the Princess Margaret Cancer Foundation. Dragon Boat Races for Cancer The BreastStrokes Dragon Boat Team formed in Guelph, Ontario, Canada in 1998, working hard to promote awareness of health, life and laughter after breast cancer. We celebrate life through the pursuit of fitness and wellness, mutual support, community philanthropy, and competition in Dragon Boat Festival races.